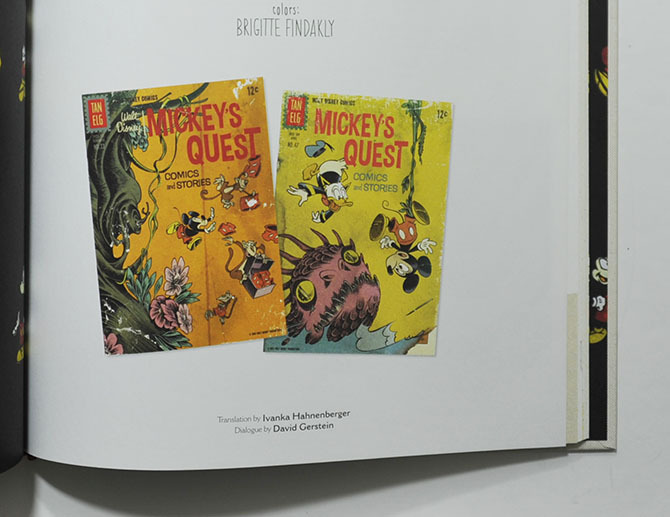 When I first heard about the French publisher Glénat's project to publish Disney albums with local artists, I didn't think I'd ever see an English translation! So out of curiously I almost got the French albums this spring. But when IDW announced at Emerald City Comic Con that they were doing the series too, I figured I'd wait for an edition I could actually read. Well, now the wait is over and I finally got hold of a copy. I knew the book was going to be in hardcover an a bit larger than usual comics – but when I got it in my hands it was a lot larger than I expected! 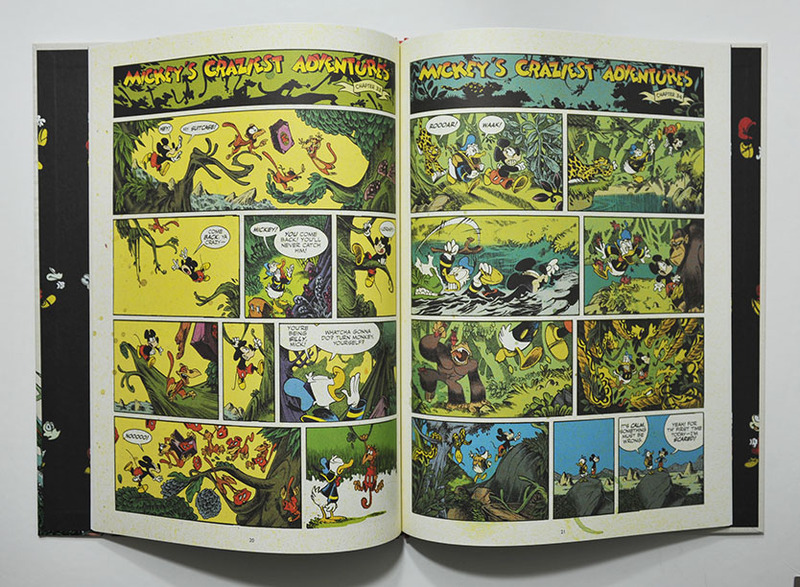 The comics are also printed on thick paper and the production quality is really great! 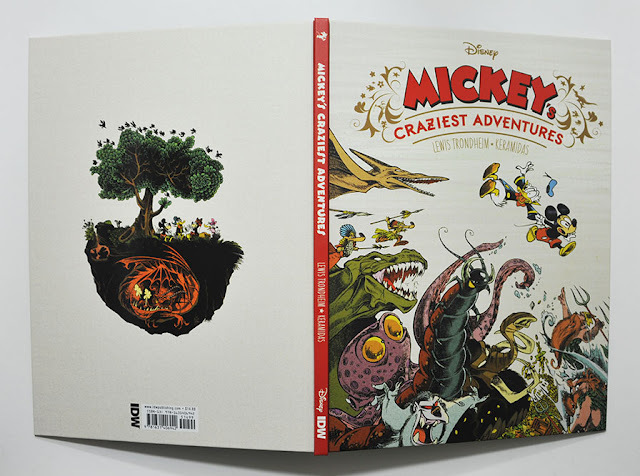 Mickey's Craziest Adventures is not just a comic adventure story; there is a "story" behind the story too. The intro tells how comic writer Lewis Trondheim and artist Nicolas Keramidas found an incomplete set of the forgotten comic series Walt Disney's Comics and Stories: Mickey's Quest at a garage sale. As the "discovered" run of comics was incomplete, we do get time gaps in the story, and part of the story is missing. The story starts with Chapter 2, 4, 7, 8, 10 etc. while the in-between parts are "lost". But the story works fine without those parts. Each page is also its own gag page even if all are parts of the same adventure story. To get an old feel of the story, elements from old real comics are used. If you look at the Mickey's Quest covers, the Mickey part is taken from an old Mickey logo found on Gold Key comics. 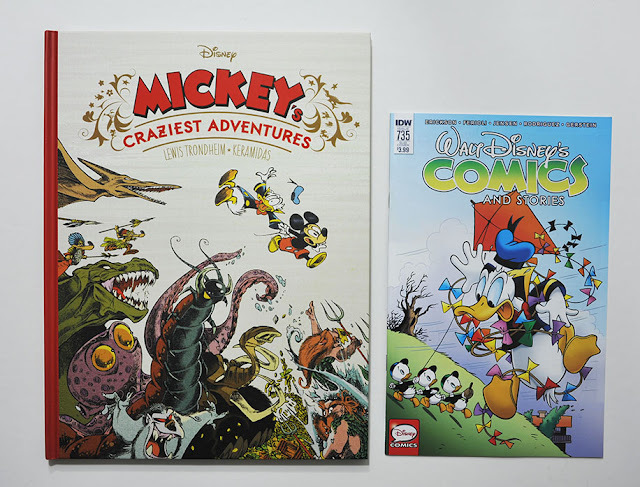 The "Comics and Stories" text is also from Gold Key comics, while "Tan Elg" looks like one one of the Dell logo variants. 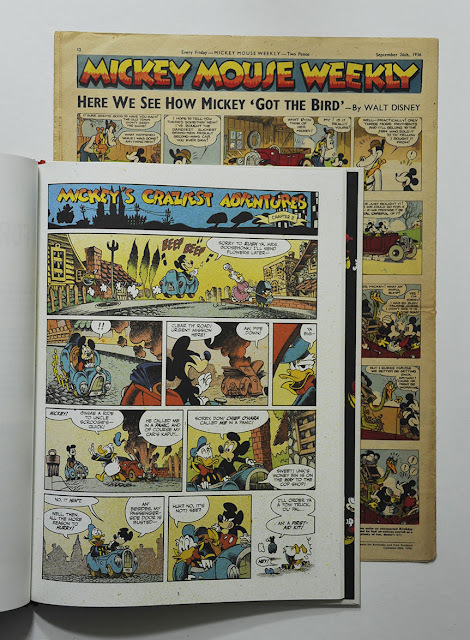 And the header on each comic page reminds me of the ones we used to see in the British Mickey Mouse Weekly. To get an old feel the coloring is also done with lots of dots, probably to imitate the four color printing technique used in the 60's. But here I think they went a bit overboard. A real four color offset printing would look like upper part of the image below, not completely covered with dots everywhere. But it's not a big deal; I like the overall look and feel of the coloring. And it probably works a lot better on thick matte paper like used in this book than the glossy paper used in the monthly IDW comics, so I'm glad they decided to go with that. I enjoyed this book a lot, so it's definitively something I'd recommend checking out. 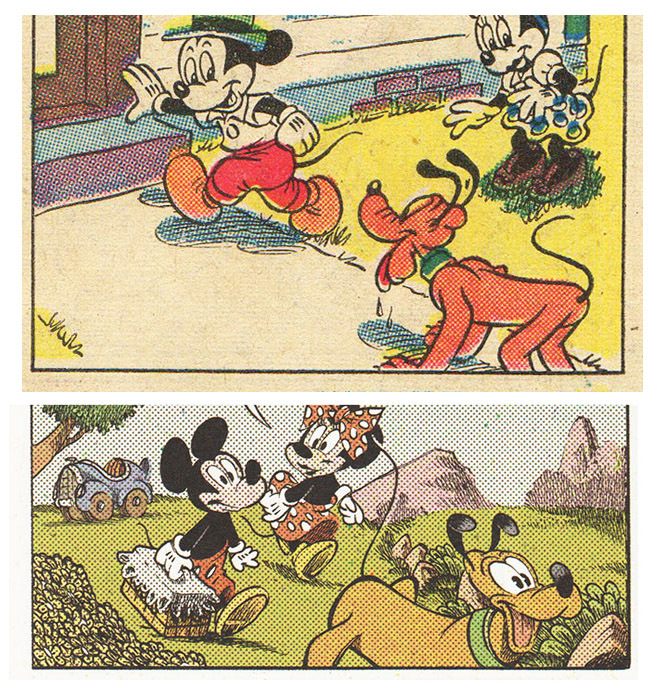 Yes, the characters are drawn off model and the art is different than anything we are used to in classic Disney comics. But that is to be expected in this series. I'm already looking forward to Mysterious Melody, the next book in the series – and I hope IDW will continue with more. So far 4 albums are published in France. 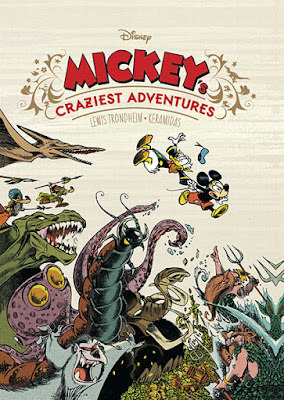 Great work here by one of my favourite Comicauthor Lewis Trondheim! I'm still waiting for the german edition which will come in better paper and so on. I grew up reading lots of Franco-Belgian comics, but I'm not too familiar with newer material. So I've never read anything else from Trondheim or Keramidas. Right now I'm following a few series from Cinebook, like Thorgal and Valerian and Laureline (two of my favorite series). But in Norway where I live we don't get much new Franco-Belgian material anymore. But the influx of Danish publications of French comics has been quite hefty in the last few years, if I'm not wrong? But you can read English, can't you? I'm recommending you cinebook, English Publisher of a lots of francobelgian Comics. They never found "old comics" in a garage sale it was a "story" to build up hype. Rather disappointed to tell you the truth. Story and design is brand new by the two of them. That's why inducks doesnt have the original entry. It’s a “lost” 1965 Disney epic, deemed too wild for publication and saved only in tantalizing fragments… or is it? 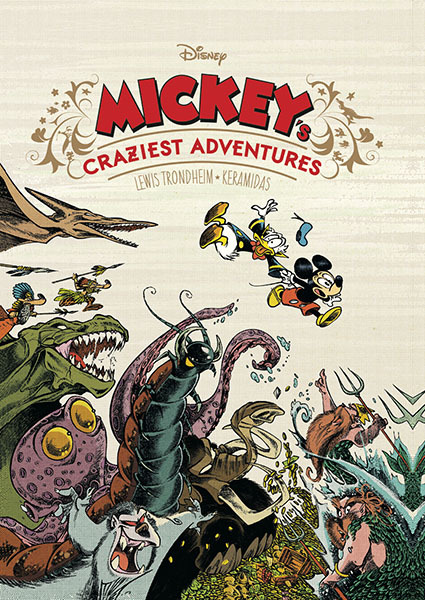 When Pegleg Pete and the Beagle Boys shrink and steal Scrooge’s Money Bin, Mickey and Donald must track them down–in what is really a brand-new album-length thriller by comics masters Lewis Trondheim and Nicolas Keramidas: told in an amazing indy style and presented like a treasure suspended in time! Hm.. I thought I made that clear talking about techniques they used to make it look old. But I added a comment about this in parentheses now in case anyone else got confused. What a great book!Loved everything about it and looking forward to the rest of them from IDW!